It's our great pleasure today to welcome Dr. Kamari Maxine Clarke (left) as an IntLawGrrls contributor. Kamari is a Professor of Anthropology and International and Area Studies at Yale University. She's also the founding Director of the Yale Center for Transnational Cultural Analysis, an interdisciplinary unit devoted to study of transnationalism, global formations, cultural and international change, especially in the global South, and Chair of the Yale Council on African Studies, which supports and coordinates study of Africa at the university. In addition, Kamari's a founding partner of the Leadership Enterprise for African Development, a Yale-Harvard collaboration that endeavors to increase leadership and governance capacity in public, business, and civil society sectors in Africa. Initially educated in Canada, Kamari earned a master's in law at Yale and a Ph.D. in Political Anthropology at the University of California, Santa-Cruz. Her research examines issues related to religious nationalism, legal institutions, human rights and international law, and the interface of culture, power, and globalization. 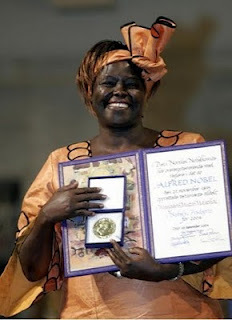 Her many publications include the 2009 book Fictions of Justice: The International Criminal Court and the Challenge of Legal Pluralism in Sub-Saharan Africa, as well as a 2010 essay collection that she co-edited with anthropologist Mark Goodale, entitled Mirrors of Justice: Law and Power in the Post-Cold War Era. Kamari draws upon this research for her 2-part series of IntLawGrrls posts (Part 1 here, Part 2 here). The series considers how the post-Cold War revival of international criminal adjudication is playing out in Africa, where International Criminal Court intervention has raised debate about peace and justice, and where viewers of a U.S.-made viral video have been asked to contribute to the capture of Ugandan warlord Joseph Kony. 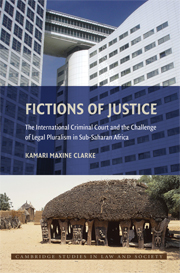 The series is based on Kamari's presentation at the March annual meeting of the American Society of International Law. It makes its IntLawGrrls début today amid debate (see here and here) over the significance of Uganda's recent capture, in the Central African Republic, of a Kony lieutenant.